It's that time a year that finds Sarah who blogs at Confessions of a Fabric Addict busy organizing her annual charity quilt challenge. 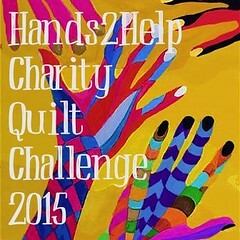 So if you too have an extra quilt, maybe thinking of joing us and donating to one of the charities highlighed at the H2H Charity Challenge. Click here to sign-up. See ya tomorrow for Tuesday Archives where our theme is Anything Green. I mean it's St. Patrick's Day...I couldn't resist a little fun in the theme! Those hexies will make a happy quilt for Happy Chemo. Perfect one to donate. That is a cheery quilt. Can't wait to see what you will do with it. I love the rows like this. And I look forward to seeing what you do. That will brighten someone's day for sure Val! I turn my back for five minutes and you have rainbows everywhere! Those hexis are gorgeous! Black is going to make those blocks just glow! Great choice.